Elliott Hoye revealed how his Shock N Awe 28 win went exactly to plan. The flyweight, who trains at Fratton’s Gym 01, clinched a first-round submission victory over Abdel Lif on Saturday. Fighting in the co-main event at Portsmouth Guildhall, Hoye finished the Frenchman via rear naked choke with just 3min 13sec on the clock. The Brighton-born talent landed two elbows on the ground before locking in the submission which caused Lif to tap out. As a result, Hoye extended his unbeaten professional record to 3-0. The 21-year-old felt the only way he could be defeated was if Lif landed his trademark left high kick. But Hoye failed to be caught by one – and knew once the contest hit the ground then it was only a matter of time before he ended it. He said: ‘The fight went pretty much how I expected it to go. ‘We knew he was pretty slick on his feet so I wanted to get it to the mat as quickly as possibly where I could use my advantage and strengths. ‘We knew his only real weapon was his left high kick. ‘Even when somebody is really good at something you know they’re going to do it. ‘His set-ups weren’t that complex and he wasn’t feinting or feinting too much. He’d just throw that left kick very fast and hard. ‘When I blocked one I thought “I don’t want to be caught by one of those”. ‘On the floor, everything he went for he was going for broke. ‘He put everything into every choke and it made me think he wasn’t comfortable and wanted to get out. ‘I only threw two elbows on the ground but as soon as I landed the first one I could feel the energy go from him. ‘I felt like the choke was coming in this fight. I’ve been working on them in the gym a lot and I’m pleased it came out in my performance. But he’s refusing to down tools and wants to climb to 4-0 before the new year. 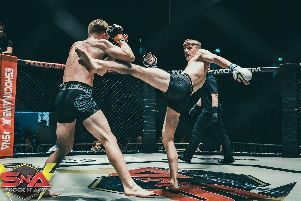 He’s hoping to find an opponent to face at Apocalypse Fight Series 7, at Bognor’s Arun Leisure Centre on December 8. ‘We’re looking at fighting on the Apocalypse card in two weeks’ time,’ added Hoye. ‘Hopefully I can find an opponent for that. ‘It would be ideal to finish with another win. I’m not complaining with three already this year but I definitely want to stay active.